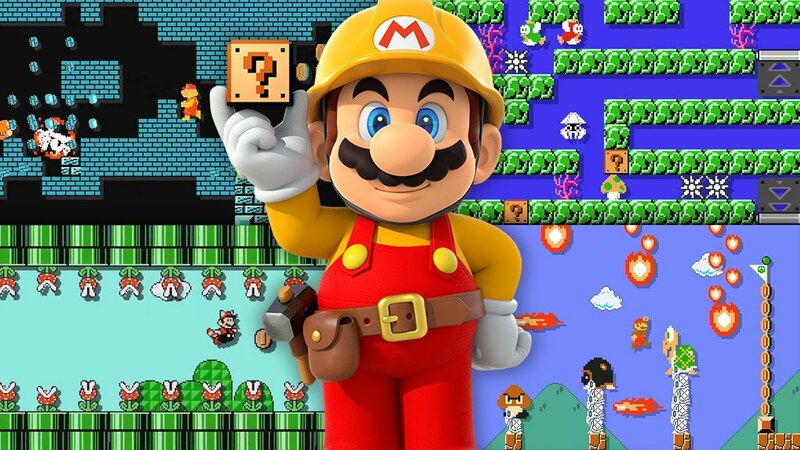 Super Mario Maker was easily one of the most innovative ideas out of Nintendo in years, and the game that could have made the best case for the Wii U GamePad if it had only come earlier in the lifecycle. The venerated Wii U "killer app" has now made its journey to the 3DS, and it packs some welcome additions in the process. But, one major missing feature easily makes this the inferior version: less killer, more filler. The major addition to the 3DS version is the new Super Mario Challenge, a lengthy collection of stages strung together like a traditional Mario game. Most of the stages are well-designed and show off the tools in clever ways. An occasional puzzle-like stage tends to break up the pacing, and the difficulty is slightly unbalanced with strange peaks and valleys. On the whole, though, it's fine and even sometimes pretty great level design. These Challenge stages also introduce the 3DS version's other major addition, Medals. Completing a stage with special criteria, like never jumping or holding onto a particular item, grants you a medal. As a result, stages can usually be approached in an easy way for the sake of completion, ignoring the Medal, or you can test your skills to finish it with these additional rules in play. The Medals really make the new stages stand out, and in some cases hint at hidden secrets. Super Mario Challenge is also how Mario Maker 3DS doles out most of its creation items. Each world shows off two or three new objects, and then completing the castle rewards you with them–compete with exhausting commentary from the game's hosts. Such a snail's pace of rewarding items makes the campaign tiring. It consists of a total of 18 worlds, each with 4-8 stages. Tying the creation tools to the stages in this way, in a game that's fundamentally about creation, makes the Super Mario Challenge overstay its welcome. I would have preferred more items per world, with a smaller set of stages, so that I could unlock all the tools that much more quickly. The creation works nearly as well as its Wii U counterpart, though I found I had to tap a little more carefully due to the smaller screen of the 3DS. It was easy for a swipe to get out of hand and make more blocks than I intended to, so be ready to familiarize yourself with the Erase tool for fine-tuning. Aside from that, though, it's just as fun and easy to make a stage, with a simple tap interface that's still incredibly intuitive. With your newly created stage polished to perfection, you'll probably be eager to show it off. Do you have any friends nearby? No? Well then, bad news. The 3DS version lacks any of the Internet-enabled sharing features. You can play your own stages, or share using StreetPass for local connections, but beyond that your brilliant 3DS-created stage will never see the wider world. This was much-publicized before release, so it shouldn't come as a surprise to potential purchasers, but it really is a sorely lacking piece of the Mario Maker puzzle. This game just isn't the same without the ability to publish stages, and I'm not sure I even understand the cause. There doesn't seem to be any particular reason a 3DS stage couldn't be uploaded to the servers while you're at home and connected to wifi, since the tools are identical. Making this more confusing is that user-created stages from the Wii U version have made the trip, to a point. Course World offers its 100 Mario Challenge across four difficulty levels, along with a set of "Recommended Courses." The latter option seems to pluck 30 stages at random from the Wii U version, which you can play or download. You can also refresh the listing to see another random 30, so on the whole this means it comes with lots of readymade content from months of Wii U creators. However, there's no real explanation for how these stages are selected, or which ones are convertible to the 3DS version. Worse yet, there's absolutely no Search function, or ability to follow particular creators. If you want to find a specific stage or if you're curious that one of yours from the Wii U version made the trip, you're out of luck. It's a level of bizarre opaqueness that I've come to expect from Nintendo's online connectivity, but the Wii U Mario Maker showed real strides in that regard, and this feels like the company has backslid. Without the ability to share levels, and with the user-created stages that are available so randomly populated, it's difficult to recommend Super Mario Maker for 3DS. The core idea is still strong, and if your interest is primarily in playing endless Mario stages without much care for who made them, it will fulfill that role. If you want to create, or engage in any sense of community, the Wii U version is still the way to go.